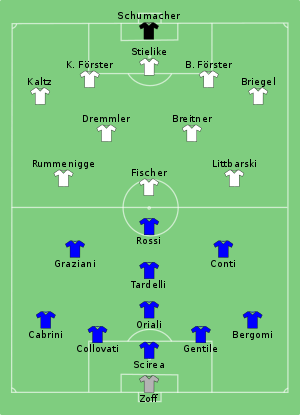 The 1982 FIFA World Cup Final was a football match contested between Italy and West Germany. 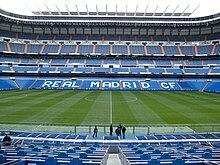 It was the final match of the 1982 FIFA World Cup tournament and was played on 11 July 1982 at the Santiago Bernabéu Stadium in the Spanish capital and largest city of Madrid. Coming after their 1934 and 1938 victories, Italy had now drawn level with record champions Brazil. Italy's Paolo Rossi won the Golden Boot as the tournament's top goalscorer, and the Golden Ball as the tournament's best player (awarded for the first time). Captain and goalkeeper Dino Zoff at forty also became the oldest player to win the World Cup. ^ "Delight for the Azzurri as home advantage tells". Fifa.com. Retrieved 13 June 2014. ^ "Pozzo the mastermind as Italy retain their crown". Fifa.com. Retrieved 13 June 2014. ^ "World Cup Hall of Fame: Dino Zoff". SportsIllustrated.CNN.com. Sports Illustrated. Retrieved 13 June 2014. This page was last edited on 2 January 2019, at 01:29 (UTC).